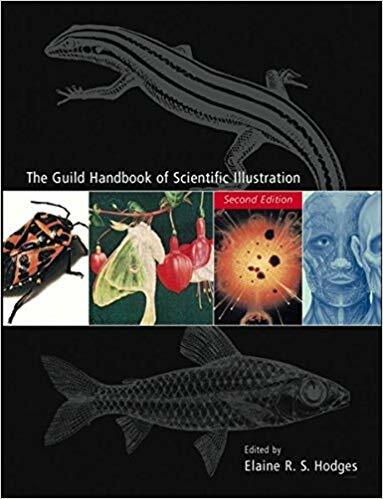 The Guild Handbook of Scientific Illustration is the most authoritative book about science illustration written to date. Referred to as the “bible” of science illustration, the Handbook is an indispensable reference for novice and professional illustrators alike. It includes more than 620 examples of scientific illustration in black-and-white and color, covers hundreds of tools and materials. Practical advice and step-by-step instructions guide readers through a vast array of techniques, including drawing with ink, pencils, carbon dust, watercolor and wash, gouache, airbrush, digital media, and many more. The Handbook covers all the best practices and skills that scientific illustrators require. These include but are not limited to: the care and handling of rare specimens; use of microscopes; preservation of finished illustrations; anatomy of taxonomic groups; and conventions for depicting specific subjects. Entire chapters are devoted to depicting subject matter such as molecules, fossils, archaeological artifacts, and medical subjects. The Handbook also provides an expert-informed introduction to the business aspects of the field, such as establishing a freelance business and contractual and copyright issues. There are two editions, both published by Wiley. The first edition was published in 1998. The second edition, published in 2003, is available in our online store and includes additional chapters on computer graphics and modeling. The article “Handbook of Scientific Illustration: survey results” by Gail Selfridge – included in the Journal of Natural Science Illustration 2015, volume 47, number 4 – analyzes a survey answered by GNSI members on the use cases for owning and learning from the Handbook. The author concludes: The Handbook is — and remains — the most authoritative volume on the topic of traditional scientific illustration and the one I turn to when wanting help in describing to others the steps in a particular process, for example transferring a sketch as a means of creating a preliminary drawing. Illustrating Animals in Their Habitats. Illustrating Humans and Their Artifacts. Cartography for the Scientific Illustrator. PART V. THE BUSINESS OF SCIENTIFIC ILLUSTRATION. ELAINE R.S. HODGES (1937-2006) worked as a scientific illustrator in the Department of Entomology at the Smithsonian Institution's National Museum of Natural History. After entering the field of scientific illustration at the Smithsonian in 1965, she helped found the Guild of Natural Science Illustrators, serving as its first newsletter editor and later as vice president and president. She lectured, taught, and wrote extensively on the field. DR. BUCHANAN is a freelance scientific illustrator who works exclusively in digital media. He has produced 33 stamp designs for the U.S. Postal Service, including Tropical Flowers, Insects & Spiders, and Reptiles and Amphibians, and has had his art appear in Scientific American, The New York Times, and Fine Gardening Magazine, among other venues. Trained as a concert pianist, he received his B.M. from Oberlin and his M.M. and D.M.A. from University of Texas/Austin and was an Associate Professor of Music at James Madison University. He has received numerous awards for his artwork, including Best of Show and Gold Medal in the 12th International Dimensional and Digital Awards Show, two Certificates of Merit from the Society of Illustrators, and a Gold Medal from Creativity 30. DR. JOHN CODY (1925-2016), a freelance Nature Artist, studied medical illustration at the Johns Hopkins Medical School after receiving his B.S. in zoology from St. John's University. After accompanying William Beebe on an expedition to Trinidad, where he illustrated flora and fauna, he studied medicine and received his M.D. from the University of Arkansas Medical Center. He was Director of the High Plains Mental Health Center for 22 years. Dr. Cody authored numerous books and articles, among them Atlas of Foreshortening, Visualizing Muscles, and biographies of Emily Dickinson and Max Brödel. In 1997, he received the Governor's Arts Award for Lifetime Achievement in Art from the State of Kansas. He taught workshops and lectures regularly. Throughout his life, Dr. Cody painted saturniid moths in their habitats to educate viewers about environmental degradation. These paintings are widely exhibited and are depicted in his book Wings of Paradise. TRUDY NICHOLSON is a freelance Natural Science Illustrator. For 32 years, she was a medical illustrator at the National Institutes of Health. Among her major clients are Grass Instrument Company, Time-Life Books, and Smithsonian Institution. She received a B.S. in fine arts from Columbia University and a Medical Illustration Certificate from Massachusetts General Hospital. Newsletter Editor for the Guild of Natural Science Illustrators for many years, she has received several awards, including the Best Illustrated Book Award from the Association of Medical Illustrators, a Certificate of Excellence from the American Institute of Graphic Arts, and a Federal Design Council Award of Merit. Mrs. Nicholson exhibits extensively, has written often about scientific illustration techniques, and frequently teaches workshops.